The gates of New Jerusalem are pearls, showing that our entrance into the city is through the death and resurrection of Christ. God has chosen us in eternity past unto sonship to the praise of the glory of His grace. This praise develops through this age and the next age until the eternal praise and glory of God in New Jerusalem. The New Testament sonship includes all the believers in Jesus Christ. In addition, Romans 9 speaks about Israel; verse 4 says “whose are the sonship…” Although Israel had the sonship in some sense, they did not have the life of God because this is only for believers in the New Testament time, based upon the redeeming death and life-imparting resurrection of Jesus Christ. Among all the descendants of the twelve sons of Jacob/Israel, only the Lord knows who will be in New Jerusalem. He is “the Knower of the hearts” (Acts 1:24). Surely the number of Israelites participating in New Jerusalem will include some from Old Testament times, some from New Testament times, and all who repent when they see the Lord, whom they pierced, coming in glory. Revelation 22:3 says that in New Jerusalem God’s slaves will serve Him. The prior post presents New Testament verses identifying specific people and also all His disciples as God’s slaves. His obedience as a slave unto death and His subsequent resurrection opened the way for us to reach New Jerusalem. This is portrayed by the pearl gates of the city. The twelve gates of New Jerusalem are twelve pearls. Jesus Opened the Pearl Gates, Let’s Enter! Philippians 2 tells us that Jesus emptied Himself and humbled Himself. “God resists the proud but gives grace to the humble” (James 4:6). In our serving God as slaves, denying ourselves includes denying our pride. Then God will grace us. This shows us that in God’s eyes gold and silver are corruptible, of little value, and not precious. 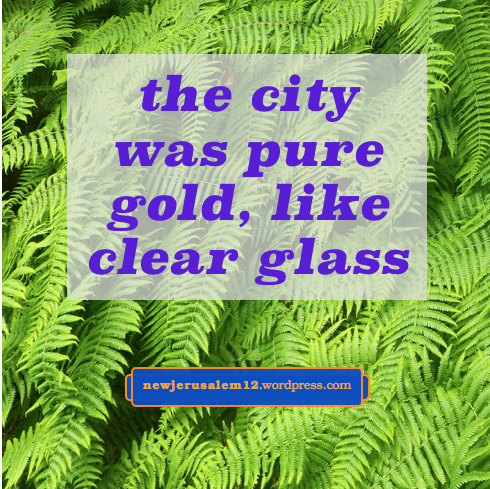 Hence, we will not see physical gold or silver or pearls or precious stones in New Jerusalem. Gold, pearls, and precious stones are all mentioned in Revelation 21’s description of New Jerusalem. But, they are not physical, corruptible materials. 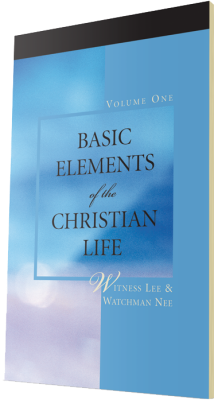 Rather, they are symbols of the Triune God—divine nature of God the Father, the redemption of Jesus Christ, and the transforming work in us by the Spirit. The Triune God in us is the incorruptible substance of New Jerusalem. 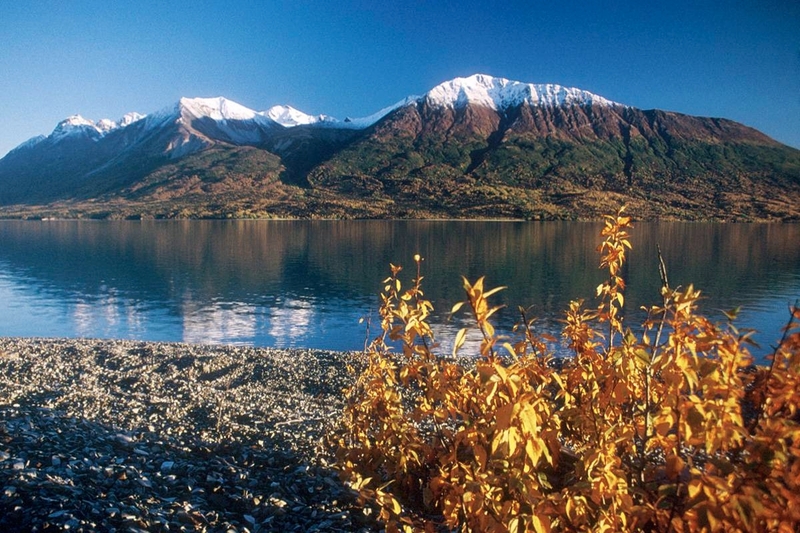 Three Precious Materials; Gold, Pearls, and Precious Stones. 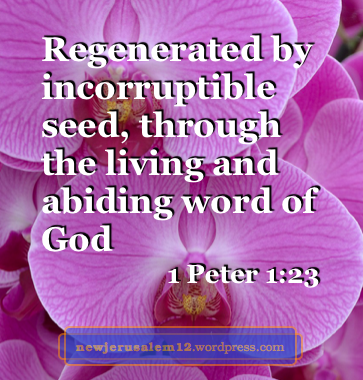 We have an incorruptible seed which brings forth the growth of incorruptible life in us for our participation in the incorruptible New Jerusalem. Thank God our Father for this! Revelation 21:24 matches Isaiah 60:3, “Nations will come to your light, and kings to the brightness of your rising.” Here “your” is probably not only New Jerusalem in eternity but also restored earthly Jerusalem in the millennial kingdom. Verse 25a matches Isaiah 60:11a, “Your gates will be open continually; they will not be closed day or night.” Again, “your” is probably both restored Jerusalem and New Jerusalem. Verse 25b speaks of “no night” because the eternal, unvarying God in Christ is the light of the city. It was easy for Isaiah to speak things of New Jerusalem because He was a prophet of the God of New Jerusalem. What Isaiah prophesied and what John “saw” (e.g. Rev. 21:2, 22) of New Jerusalem is the inheritance of all God’s people. 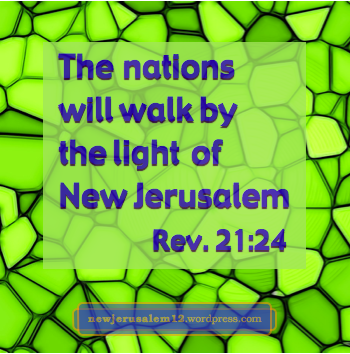 New Jerusalem is a city “having the glory of God” (Revelation 21:11). In Genesis 2:7 God “formed man with the dust of the ground and breathed into his nostrils the breath of life, and man became a living soul” and Romans 9:21 describes man as vessels of clay. We are on an amazing journey from vessels of clay to a constitution with the precious materials of New Jerusalem. 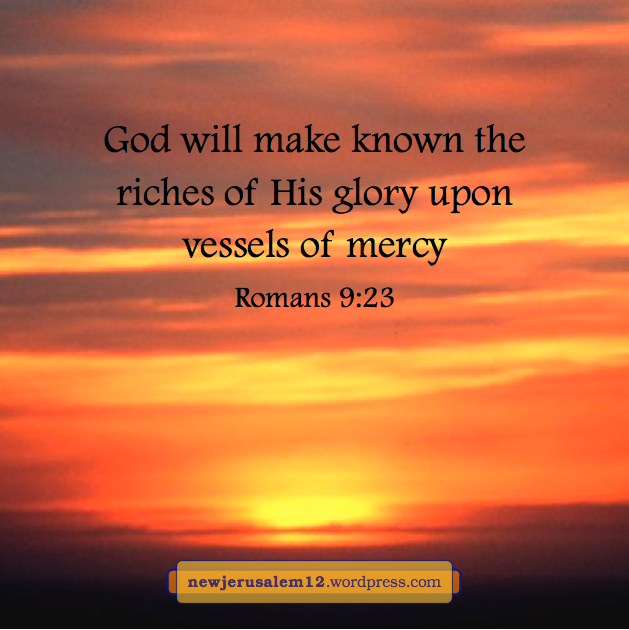 This journey is dependent on God’s mercy, making us “vessels of mercy” upon whom God will “make known the riches of His glory” (Romans 9:23), a glory ultimately displayed by New Jerusalem. Although the glory will be made known through us, it is not of us and we cannot boast. Rather, “we have this treasure in earthen vessels that the excellency of the power may be of God and not out of us” (2 Corinthians 4:7). Christ is the treasure and we are the earthen vessels. He is the excellent One! The next two posts will be a brief look at the journey from clay to the precious materials of New Jerusalem. Photo by Commander John Bortniak, NOAA Corps, courtesy of NOAA (U.S. Dept. of Commerce). * Part of note 1 on Revelation 21:21 in The Holy Bible, Recovery Version published and © by Living Stream Ministry. 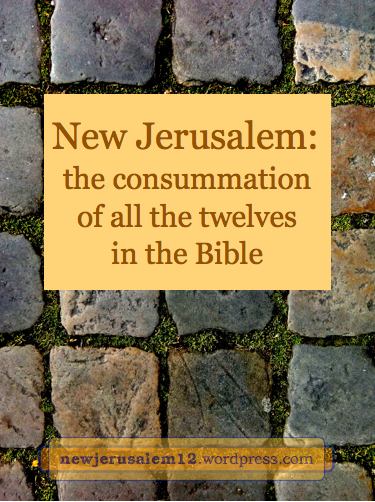 New Jerusalem has the Bible’s consummate glory. 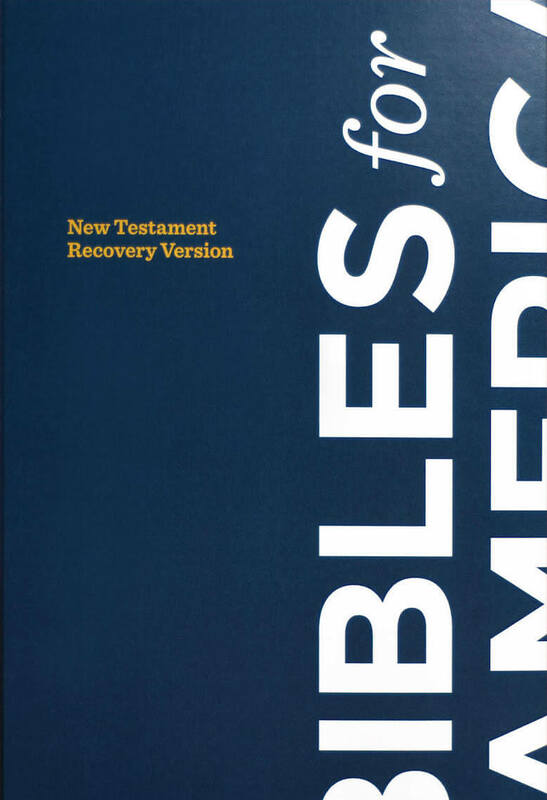 The prior post touched glory in the Old Testament; this one looks at glory in the gospels. What the Lord passed through in the gospels—incarnation, death, and resurrection—was to redeem us and bring us into God so that we could be in New Jerusalem. 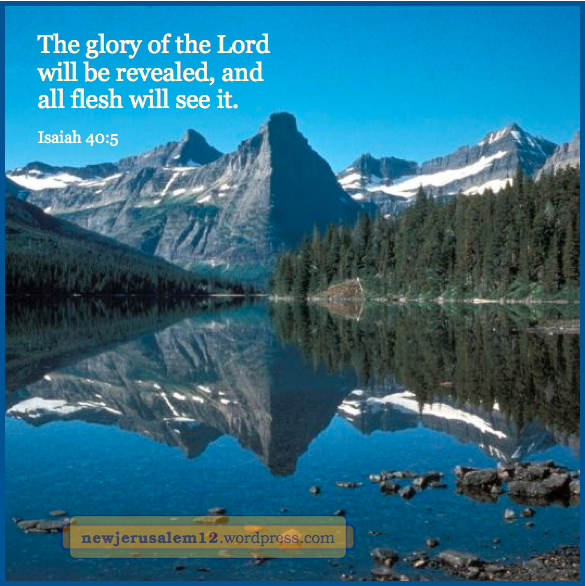 The glory in the gospels is foretold in Isaiah 40: “the glory of the Lord will be revealed, and all flesh will see it.” Then John 1:1, 14 says, “the Word was God…the Word became flesh…we beheld His glory.” According to 2 Peter 1:16-18, the disciples beheld His glory on the mount of transfiguration. That beholding was for a short time, but the glory in New Jerusalem is eternal. Luke 5:25-26, 7:17, 13:13, 17:15, and 18:43 are examples of people glorifying God as a result of seeing acts which they knew were of Him. Let us expect more in the kingdom and in New Jerusalem. In John 12:23 Jesus said, “The hour has come for the Son of Man to be glorified.” In the next verse He speaks about His death. And at His death, a centurion glorified God (Luke 23:47). In John 17 the Lord prayed, asking the Father to glorify Him so that He could glorify the Father. This prayer was answered in His resurrection. This death and resurrection are our entrance into the glory of New Jerusalem. In Matthew 16:27 and 24:30 the Lord told us that He will come visibly in glory. This glorious coming will bring His kingdom openly to earth and bring the manifestation of New Jerusalem closer. Enter New Jerusalem Now____Jesus Opened the Pearl Gates, Let’s Enter! Jesus Opened the Pearl Gates, Let’s Enter! Here is a list of prior posts on this topic (verse numbers are in Revelation 21). In New Jerusalem the golden base and street (v. 18, 21) signify the Father’s divine nature, the pearl gates (v. 12) portray the Son’s death and resurrection, and the precious stones (v. 18-20) depict the transforming work of the Holy spirit. The composition of the city is the Triune God mingled with God’s people. 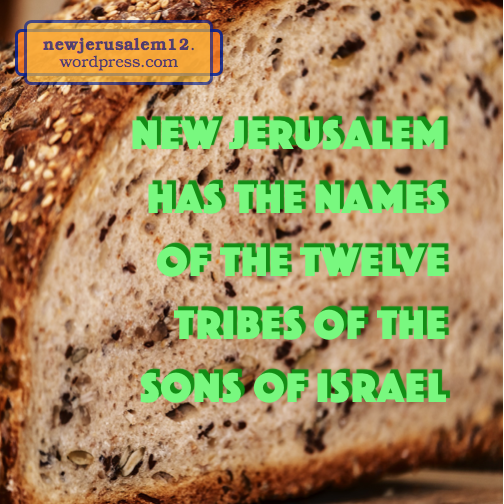 New Jerusalem has twelve gates (v. 12-13, 21). The three gates on each side show that the Triune God is our entrance. Gates on four sides proclaim that the city is open to all humanity. Revelation 21 does not record the measurement for the gates of New Jerusalem. This probably indicates that Christ’s death and resurrection have unlimited (immeasurable) efficacy. The entrance to New Jerusalem is guarded by the law, signified by the angels at the gates (v. 12). Whoever enters New Jerusalem must satisfy the law’s requirements. In ourselves we can never satisfy the law, but Christ has done it for us! The pearls (v. 21) portray the death and resurrection of Christ. Through faith and baptism we are united with Him in His death and resurrection; this is our entrance into New Jerusalem. New Jerusalem has a great and high wall (v. 12) for separation and it has twelve gates for its entrance. Sinners are kept out by the wall but by faith we enter through the redeeming death and life-imparting resurrection of Jesus Christ. Our receiving of the crucified and resurrected Jesus is our entering into New Jerusalem. Through His death all the negative things that would keep us out of the city have been removed. Through His resurrection we receive the eternal life, the life (v. 22:1-2) of New Jerusalem. 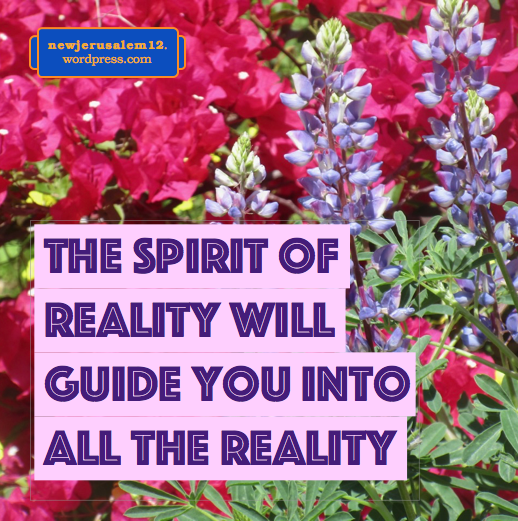 Jesus is our way, our reality, and our life. His coming to abide in us and bringing us to abide in Him is our way to New Jerusalem. We should not look for a way apart from Jesus Himself. Revelation 22:14 declares “Blessed are those who wash their robes that they may have right to the tree of life and may enter by the gates into the city.” Three steps are presented: we wash by confessing our sins, we receive Jesus as our life supply, and we enter New Jerusalem. God the Father “delivered us out of the authority of darkness and transferred us into the kingdom of the Son of His love” (Colossians 1:12-13). This transfer from the authority of Satan to the authority of God is the basis for our entering New Jerusalem.